As I have said before on this blog, humor is a wonderful way of exposing the idiocy of your opponents arguments. Charlie Chaplain and Mel Brooks knew that in their powerful riffs on Hitler. And now a Swiss cartoonist whose work was reprinted in the International Hearld Tribune has done the same to the Iranian president. I am unable right now to post a link to it but it essentially showed the Iranian president Ahminajead at a meeting of the IAEA [Int. Atomic Energy Commission] and saying: I would like to announce the Hisoshima cartoon contest. The other people present have their heads in their hands. It is a commentary on how he and -- to some degree his country -- have become the laughing stock of the world. Thank you for your work Deborah. Recently I referenced your website in reference to the Irving case. Please tell us the name of the cartoonist. The Cagle web site has the work of cartoonists from around the world, so we might be able to find out who it is and view the cartoons and his other work ourselves. But, Deborah, isn't that a dangerous prospect? I forgot his name right now, but another historian wrote that the world laughed Hitler off as some mad man who wouldn't be around for very long. He made the very good argument that when the head of a country declares to wipe an entier country of the map, the world should take him at his word, and believe that he's planning to do just as he says. I am tracking down the name of the artist and will post it soon. Charlie Chaplin were not laughing off Hitler, they used humor to skewer him. I have posted Keev's comment to give some indication of the level of some [though not all] of the emails I have gotten supporting David Irving. Hey, here's a thought: whenever someone makes a REALLY bad case for against something, you can say he or she "pulled an Irving"
ex-"Did you go to the lecture on funding for the new transplant donor research initiative last night?" "It was going fine until the head researcher pulled an Irving with his data numbers"
"Yes, they'll never get grants now"
Or, rather, when someone deliberately falsifies data for their own gratification. Check out Keev's profile and interests. Res ipsit loquitor. When you use an obscene personal attack in an argument, it's the mark of a guy who has no argument. I like what Andy Rooney wrote decades ago about dirty words...the sheer pointlessness of them. 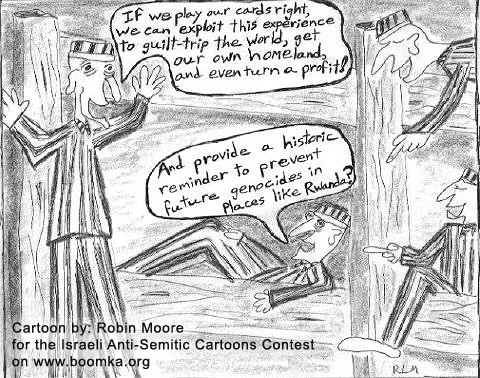 I ran into the Israeli Anti-Sematic Cartoon Contest, some of them are pretty good, and among their points is the importance of humour for these subjects. Maintaining certain subjects "taboo" is a lot worse than discussing them. This one is my favourite. Speaking of humour and films, a week ago Sunday (26th March) BBC Four (digital TV) screened a comedy film made during WWII called "To Be Or Not To Be" with Jack Benny. It dealt with the occupation of Poland including Hitler making an appearance to see a ply at a theatre company in Warsaw. I've never even heard of this film before and was delighted to be able to see it. "Skewer" is the exact word for what this film did with humour to the Nazis. You will have to put it somewhere between Charlie Chaplin and Mel Brooks and is a must see if you haven't already done so. This was screened just before Daniel Anker's 2004 film "Imaginary Witness: Hollywood and the Holocaust" which covers the period from 1930s to the present with extraordinary film footage and comment. This too is an incredible film. I was glad to see these getting television broadcast here in the UK to a wide audience. I wait for the day when television is available on the Internet so these kinds of programmes can be seen worldwide. when I visited the Holocaust Museum in Washington DC, I bought a book called, "Laughter In Hell" It featured stories and jokes that inmates shared while in concentration camps.